In the seventies, a large amount of F-4E Phantom II were shipped by the US to Turkey and the Imperial Iran. Therefore the 283th Fighter Division's two regiments were also upgraded with MiG-23M Flogger-B type between 1975 and 1978. The MiG-23M type was expected to rival the US Phantom. 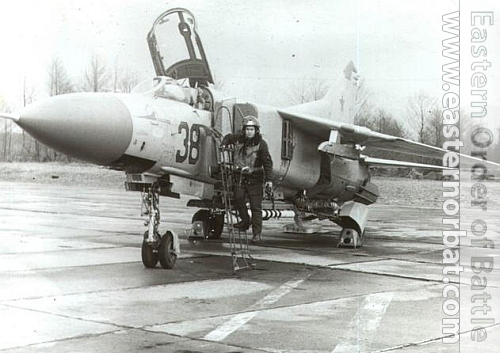 The division's third regiment continued to use the old delta-winged MiG-21SM Fishbed-J type. 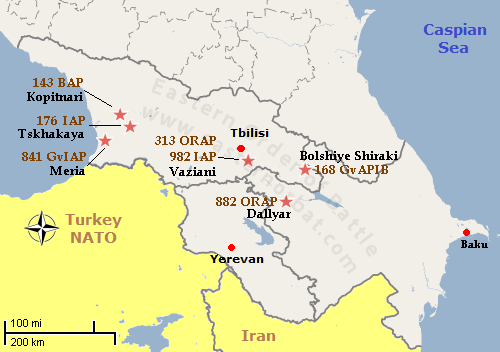 The new Iranian and Turkish Phantoms were also a threat the old Yak-28 and Su-7 bombers. Therefore they started to replace them beyond the Caucasus too. 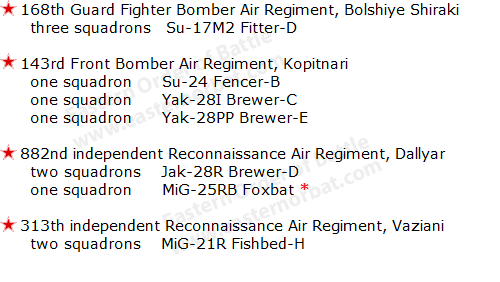 From 1977 they stared to re-educate the staff to the variable swing-wing Su-17M2 Fitter-D and Su-24 Fencer-B bombers. In the mid-seventies the old IL-28R Beagle reconnaissance machines were withdrawn. Instead new MiG-25RB's and used Yak-28R Brewer-D reconnaissance versions from the Baltic States arrived. In 1978 a squadron of new Mi-8PP Hip-K Electronic Countermeasures helicopters arrived at Dirbi airport. These got equipped to the 34th Tactical Air Army's new ECM Helicopter Squadron. 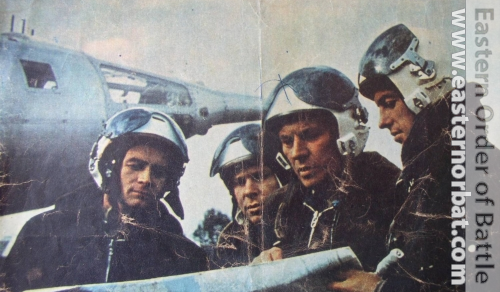 Pictures about the Soviet 143rd Front Bomber Regiment's life in the seventies.